This is the season of inspiration. I know everyone talks about gardening in the spring, but this is the time of year that motivates me. Every garden has come into its own. Yards, parks, estates, landscapes: by now you know what they are going to be. Thick slabs of watermelon, backlogs of zuchini, fulsome fruit and fields of flowers: even the weeds seem mastered by an all-encompassing abundance. The failures (we've all got them) are totally hidden underneath successes--or in my case, underneath other failures! There is no guilt left: we're off to enjoy Labor Day with clear consciences. It can be time to prepare for fall crops of greens or cool-season vegetables: I'm curious to try carrots in a deep container that I can bring in for cold nights. Bulbs will go in the ground a bit later, and canning, freezing, and preserving operations are clucking along. The season extends to the Gardens' September calendar : Corn Maze at Chatfield, the Fall Plant and Bulb Sale at York Street, in HABIT presented in partnership with Colorado Art Ranch at Chatfield, and a slew of Rocky Mountain Gardening classes. 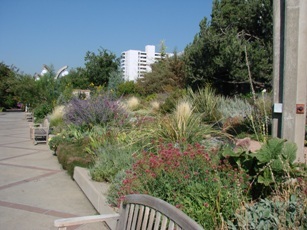 The first is Xeriscape Gardening and this a great season for learning new plants and examining new garden ideas. In the spring, you have to take on faith that that tiny seedling will become the beautiful plant in the photo. 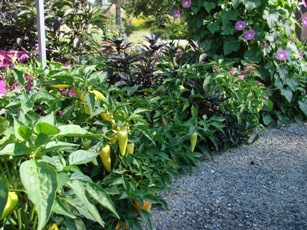 By the end of summer, you can really appreciate how other gardeners have used the the plant. Garden designs can seem like little more than blueprints at first, but as plants reach their final height, you can judge the design's strengths or flaws for yourself. The season lends itself to inspiration in the garden like no other. Take note for next year, soak in the good weather, and let the Labor Day landscapes do their job and inspire you.